This HS Senior Was Accepted to 149 Colleges. That’s a Problem. May 1, also known as College Decision Day to Seniors across the country, is right around the corner. This is the day by which Seniors must declare which college they plan to attend next fall. Many students see this day as the culmination of years worth of work, and a significant rite of passage in their life. The more we continue to encourage students to apply to great numbers of schools, the more every system of admissions continues to break. Sure, students should do their due diligence, find a good number of schools to apply to, and confidently submit their applications to places they would like to attend. But remember that they are only going to be able to attend a single school after graduation is critical. Having 149 options to select from is not a useful place to be after a long and arduous search process. At this student’s school, they have a million-dollar-scholar club that students can become part of if they gross over $1.0 million in merit-aid. This was part of the student’s motivation to apply to so many schools. She wanted to be a member of this club. While it is common practice for schools to share their astronomical numbers of aid their students earn, the actual number is a very misleading figure. In fact, many top-tier colleges offer $0 in merit-aid as they are need-aid only institutions. Some small schools will automatically give every one of their admitted students a certain dollar amount. This student may have received a $30,000 per year scholarship to a rural Nevada college that she had no interest in attending. But, she added the $120,000 to her total nonetheless. Despite a recent call for an increase in School Counselors by 10,000 (!!! ), there is still a woeful student: the high counselor ratio in a typical American secondary school. The average school has a 1:438. ratio, with states like California coming in at 1:475. 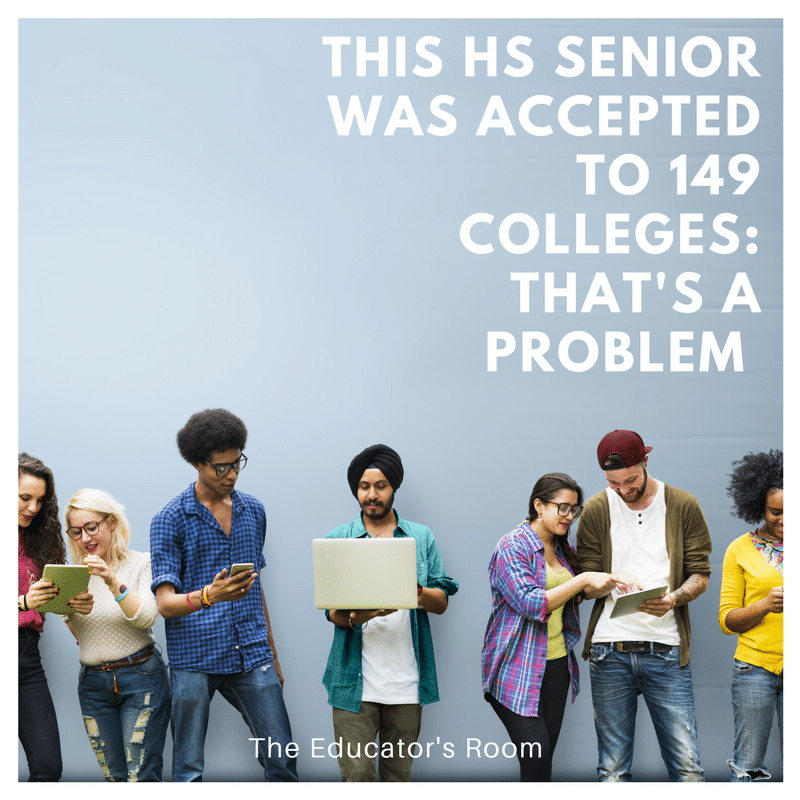 This scenario highlights the absolute need for additional guidance in increasingly ambiguous processes like submitting college applications. Additional access to a School Counselor would have helped this young person understand that she did not need to actually apply to all of these schools because she was well qualified in many of their candidate pools. My last point about this scenario is rooted in an examination of the college application process as it affects mental health. At its core, the process is externally validating. Students are seeking the ‘YES’ from colleges because society tells them they must get more yes answers than no answers. But what society continues to leave out — much to the detriment of students — is that one yes answer is enough. With one confident yes answer, think about all the ways this student could have spent the time she earned back: Learning something fun that she always wanted to learn, reading a few more interesting books, hanging out with her friends, earning some money working a part-time job, cultivating a garden in her community, doing yoga, walking dogs at the SPCA, spending time with her siblings, painting, taking time to enjoy lunch……… you get the idea. ** To be clear, she was not going to take all $7.6 million of this money to a single school. This number represents the total dollar amounts she was awarded. For example, if she was awarded $12,000 per year from a small liberal arts college (a commonly awarded amount from small schools), this number would be multiplied by four, and her total for that school would be $48,000. Based on the total number of schools she applied to, she was averaging about $51,000 per school or about $12,750 per year. Likely most of this money was awarded by small liberal arts colleges with tuitions at around $30,000 per year, leaving her with around $17,000 in tuition still owed. A hefty bill for any student. The average student:counselor ratio is much higher than 250:1. That ratio is actually the recommended number, not a reality. Good catch Chris. Including part-time staff, the ratio is more like 280:1 in secondary schools. But, when you factor in primary and middle schools, the ratio becomes 480:1. Mind-bending, regardless.